Artsmith Media is a results-oriented web design and development company helping businesses and non-profits use internet solutions to increase their bottom line. We specialize in web system planning, graphic design, and web marketing. We use Drupal, an advanced content management system, to build client projects. Our high-level Drupal development allows our clients to manage, edit and create new content/pages on their web sites with ease. Our clients come primarily from referrals from customers who are thoroughly satisfied with their sites' look, feel, and ease of maintenance. Our client roster includes the National Osteoporosis Foundation, National Bone Health Alliance, The Alliance for Global Education, The Hurrah Players, SympathyFood.com and many more across a large spectrum of business categories. 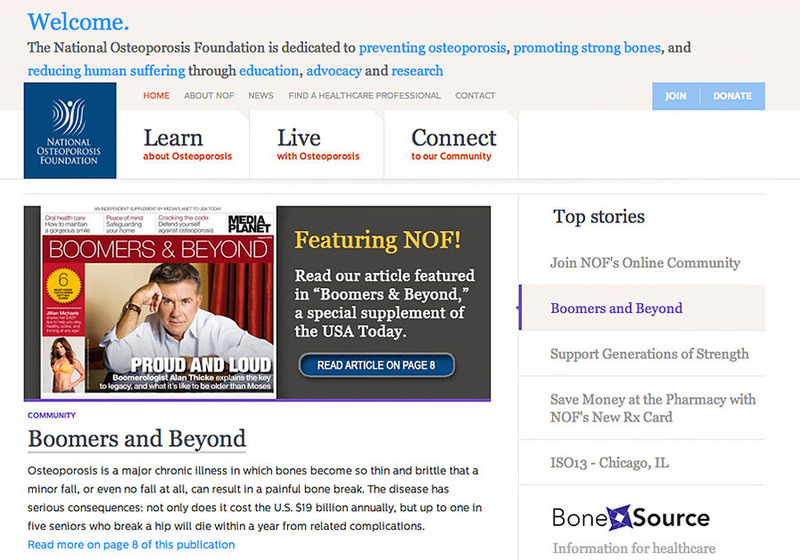 Artsmith Media has been working with NOF since 2010, implementing many forms of communication to spread awareness about bone health and osteoporosis prevention and building campaigns to generate interest in the bone health community. Artsmith Media team members also function as consultants to the organization for web strategy and marketing. In 2012 we managed the development of their new website. We worked with NOF and many of there constituents to better understand how users were interacting with the website. The new navigational structure of the site was developed to create direct routes to the topics of interest that seemed most important to the majority of users. By breaking down the main navigation into Learn, Live, and Connect we are essentially speaking directly to the users and helping them identify the stage of osteoporosis that they are struggling with. Additionally, we highlighted the BoneSource area of the site throughout the home page to help the HealthCare Professionals find a direct path to information that will interest them.